The process used by our experts here is plain common sense, which seems to be a scarce commodity on the web these days, anyway. Keeping in mind, the requirements of our client, we decided to go with a soft welcoming theme that was able to portray the professional ambiance of the website, along with staying in tune with the logo of the business. Emphasis was laid not only on the design but also on the content of each page, where chunks of information was replaced by SEO friendly content that would increase the webpage’s ranking on the SERPs. 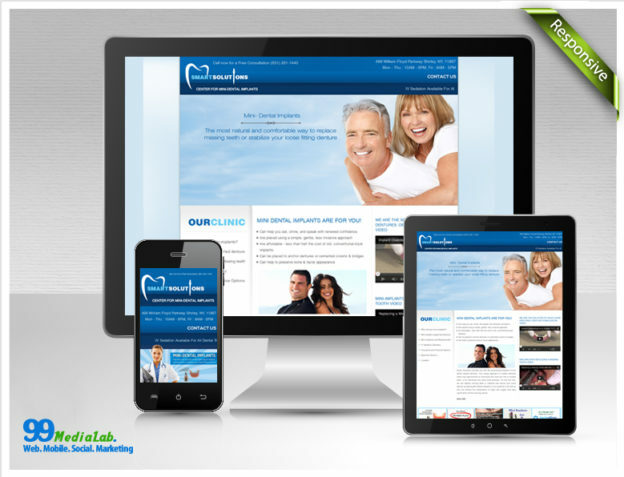 Smart Solutions Dental Implants stressed on the importance of a user-friendly and interactive website. To meet the challenge head on, our team of expert designers and developers, along with our SEO team collaborated together to create a truly effective and efficient business website which has ranked on the first page since its inception. In order to increase the Interest Quotient of the website to keep up with the strong competition in the local NYC domain, our team also added interesting and informative videos which describe the dental clinic in detail as well as the services it provides. • Content Management System: We used WordPress as the content management system for the Smart Solutions Dental Implants website, mainly because of its easy to use features and better usability. More importantly, WordPress was mainly used because it does not need technical expertise for its maintenance once the site is fired up, making it easier for our clients to make tweaks whenever necessary. Obviously, the site also displayed the usual graphics, SEO content, tabs and menus. • Mobile Responsive: To keep up with the times, the website also has to be mobile friendly. Our team of experts made sure that the website was both functional and responsive while being used by hand held devices as well. • Search Engine Optimized: Along with a great web designing team, we also added our SEO expertise to increase the website’s ranking and visibility on the SERPs. To do that we improved the headers, images, Meta tags, and both the internal and external links as well. • Professional Appearance: Our team came up with a visually appealing, polished and professional website for Smart Solutions Dental Implants, which not only reflected their company, but also their service in the dental industry. Designing and developing the layout for the Smart Solutions Dental Implants website was a challenging and exciting project for us. The part that we’re most proud of is that the ranking of the website has improved, making it a victory for not only our client but us as well.